Neymar sends private jet to bring the model he met in Ibiza to Barcelona. 28yr old Serbian model and reality star Soraja Vucelic (pictured) claimed in a recent interview with a Serbian newspaper that 22 year old Barcelona and Brazilian footballer Neymar da Silva Santos Junior, sent a private jet to pick her up to visit him in Barcelona after the pair met in Ibiza…and she shared a pic of herself in the jet in Neymar’s jersey to prove she was not lying. 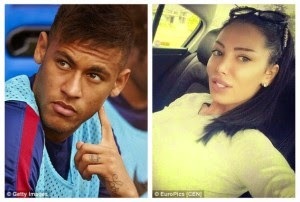 Soraja told Kurir newspaper that she met Neymar in Ibiza in July and they exchanged contact and frequently chatted via Skype. One day he told her he wanted to see her and sent a private plane to pick her and her friend up. Soraja was in Barcelona for many days with Neymar. This happened this October but Soraja refused to say when exactly and what happened between them.